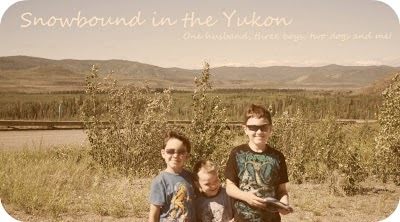 A few weeks ago we went camping with some dear friends. My family ended up only staying one night, it was tiring and stressful with four kids to look after. We woke (I use that term loosely as I didn't sleep a wink)up the next day to rain. We added to the need to go home since we were not prepared for once for the wetness. We stopped at the interpretive center where my brother works. I wish it were a nicer day to enjoy the views. It's so beautiful up the Dempster. We may have to make a day trip next weekend to get more pictures.